◆All speaker device including Subwoofer, Amplifier, Monster, Audio receiver, CD players, DJ equipment. ◆All types of digital coaxial audio ports, HDTV, game console and any other digital device, amplifier or receiver with RCA jacks for audio inputs. ◆Audio receiver, AV receiver, Radio receiver, Home theater sound/speakers and Other Music Devices with a RCA audio socke. Innovation and cutting-edge technology in this special Audio cable with silver micro conductors for over 11 years. More durable and environmental material with 24k gold plated head anti-oxidation and damp. 24 months warranty and lifetime customer serves. Tone is pure and warm with stable transmission, Oxygen Free Copper cable combined with a gold plated shielding allow for a maximum audio video quality, reduce sound distortion and signal loss. More durable, flexible, easy to plug into your audio device etc. Please be assured that if you do have any problems with our product, we are eager to resolve them. 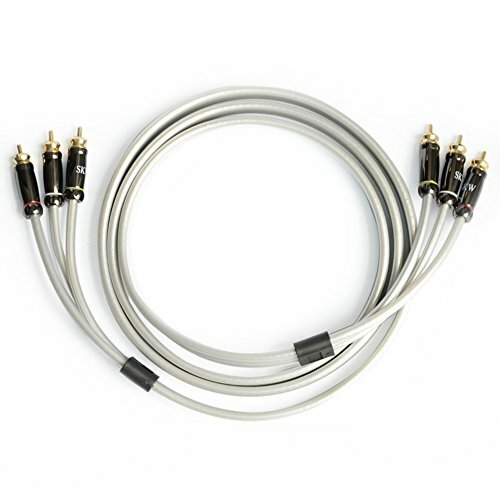 SKW Digital Audio Coaxial Cable, Easy to pull for new work, Great connections on each end with Subwoofer,they are cleaner sounding with a more natural, neutral sound,Affordable price, which was lower than a less desirable product with the same gauge from local hardware superstores. Compatible with Any Audio digital Devices with 3RCA Port for DVD/Blu-Ray players,Subwoofer, DJ equipment, TVs,Amplifier, Speaker, Xbox 360, PS3, Wii, HDTV, A/V receiver, Home Stereo Sound Systems. Shielding: No more fear of wire breaking down after a few years of use with extra shielding, We have strict test for each Audio cable before we sent it to you, it's braided copper, 99.9% oxygen free copper with 24 gold-plated connectors and PVC cable jacket. Colors and advantage: 26 Feet white Audio Cable, The quality was far superior to other brand used cables, Gold connectors are solid, durable and nice gold plated ends, sturdy design and the Y looks sturdy, it will hold up well over time. The components used and the thickness of the cable itself set it apart from cheaper cables. Warranty: 24 months warranty and lifetime service, If you have a compatible device, these High-speed cables will work perfectly fine for you, Why not give us a chance? Manufacturer: Zhuhai Leikesi Electronic Technology Co., Ltd. Publisher: Zhuhai Leikesi Electronic Technology Co., Ltd. Studio: Zhuhai Leikesi Electronic Technology Co., Ltd. If you have any questions about this product by SKW, contact us by completing and submitting the form below. If you are looking for a specif part number, please include it with your message.